Jetlag in Jävle. Getlag in Gävle. Nah. That thing only works phonetically: Jetlag in Gävle. Jetlag is the damnest thing: you are sleepwalking through a day, just waiting for the moment when you can go to bed, and when you finally get to that moment, the sleep-clock in your brain is off and you just lie there, hours passing with no sleep…1am…2am…3am…wonderful. As I write this on the train from Gävle I am still jetlagged, damn it. But let’s talk about the fun things that happened this week instead. We recorded ”Belle Époque”, Tobias Broström’s Piano Concerto with Gävle Symphony Orchestra and Johannes Gustavsson conducting. It was great, things went so smoothly. There were no ”sour moments” during the two days and we finished ahead of schedule. Applauds to us! One more! And here is a video! There will be three concertos and two orchestral pieces on the CD, the Trumpet Concerto is played by Håkan Hardenberger, and the Violin Concerto is played by Karen Gomyo. Everything is conducted by Johannes Gustavsson. I am proud of the company, indeed. 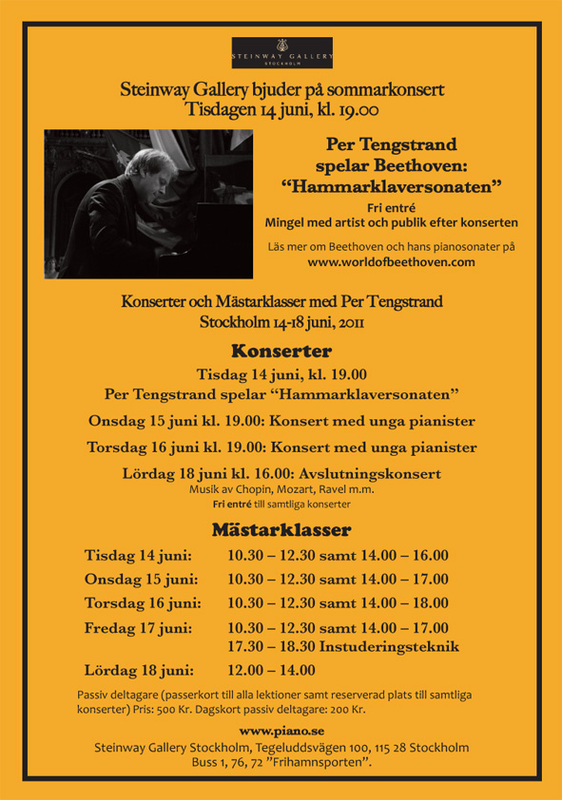 Nest week’s thing will be the concerts and masterclasses at Steinway in Stockholm. We have a fantastic set of young pianists, and I would advise you to come listen to them. Seats are free, and I start by playing the unplayable Hammarklavier Sonata in Tuesday at 7pm. Because of the travel and recording, I have no news on the Beethoven Volume 4 front. I just edited a minute of music, but that’s about it. I want to have it ready by the end of July, so I’d better push myself a bit. As I am writing this I am traveling to Växjö, where I will use the weekend to record a couple of tracks for Volume 5: The Pastoral Sonata and perhaps a movement of the Moonlight, too. The beginning credits are in such good style, the music is written by the great (haha) Legrand, and Catherine Deneuve is more beautiful than all of today’s silly movie-stars together. Here is the beiginning credits, the scene when he leaves, and the end. Her daughter in the car is their child. My interpretation of the ending is that he has moved on, but she is going out in the cold, still regretting. PS: ah, ah … , the boy in the film is an Italian actor! Nice to hear from you, Laura, and thanks for a fun comment! Is the blog showing correctly for you now? No, unfortunately! But I can see it with another browser (or another PC). Perhaps if you update your browser? What browser are you using?